B: Fear Colours (Wrangler Remix)Inspired by the post-punk legacy of her hometown, Manchester, England, as well as classic college rock of the '80s and early '90s Lonelady's Julie Campbell began her forays into art punk by making four-track recordings with her guitar and drum machine. 'Fear Colours' has been remixed by Stephen Mallinder from Wrangler, the supergroup formed on the fringes of electronica. The Vinyl Factory has partnered American multi-media artist Doug Aitken and the Barbican to bring his acclaimed 'Station to Station: A 30 Day Happening' to the UK for a month-long, building-wide, art intervention, from Saturday 27 June - Sunday 26 July. 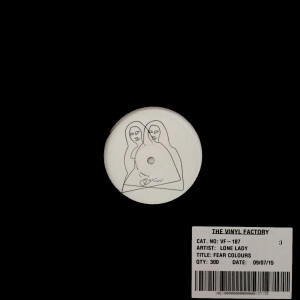 For the duration of the event, which features residencies, installations, live performances, workshops, screenings and more, The Vinyl Factory has created The Vinyl Factory Recording Studio to provide a space for musicians and artists to experiment and improvise and has installed The Vinyl Factory Press on-site to manufacture these recordings into vinyl editions. Lonelady recorded 'Fear Colour' in The Vinyl Factory Recording Studio as part of Station To Station. Pressed on-site at the Barbican Centre for Station to Station July 2015.